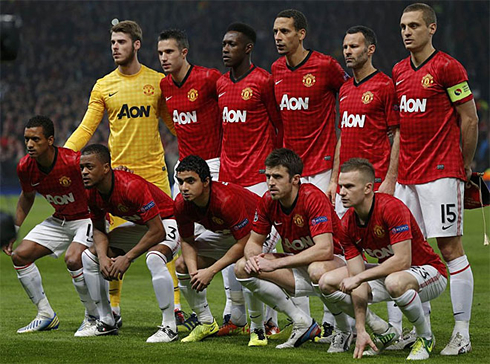 ﻿ Manchester United 1-2 Real Madrid. Ronaldo goal knocks out United! 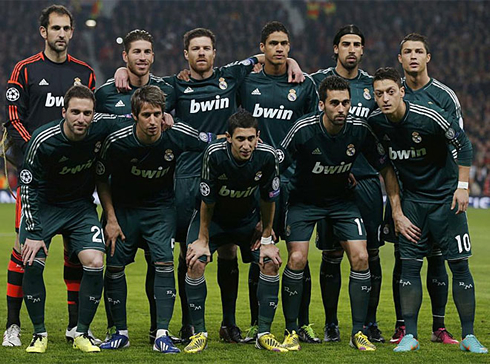 05.03.2013 » Manchester United 1-2 Real Madrid. Ronaldo goal knocks out United! 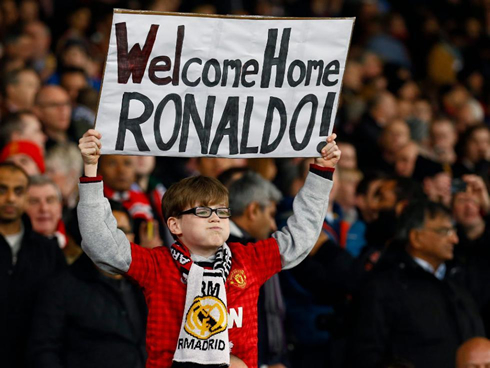 Cristiano Ronaldo returned home this Tuesday night, leading Real Madrid to a 1-2 win at Old Trafford, against his former and beloved club, Manchester United. The game's turning point took place near the 57th minute, as Nani was shown a straight red card that allowed for the Merengues to begin the "Remontada". A Sergio Ramos own goal gave the lead to the home side, but Luka Modric and Cristiano Ronaldo responded and sent Real Madrid into the UEFA Champions League quarter finals stage. Real Madrid is on the UEFA Champions League quarter-finals, after beating Manchester United by 1-2 at Old Trafford (2-3 on aggregate), thanks to Luka Modric and Cristiano Ronaldo goals, obtained deep in the second half. The Portuguese player had an highly emotional night, as he met most of his old friends he had left in Manchester several years ago and earned multiple ovations and tributes from the Red Devils fans in the stands. However, all the love and affection from the home fans didn't seem to have bothered Ronaldo much, when it all came down to apply the final blow in the series. CR7 scored the winning goal with roughly still 20 minutes left to be played, becoming once again the UEFA Champions League top goalscorer this season with 8 goals in 8 matches and he will surely look back at this game in the future as one of the most memorable clashes he has ever had. Sir Alex Ferguson had alerted that he knew exactly how to stop this Real Madrid side, especially after seeing them running over Barcelona for two times in a row in the past week. If it's true that United had already somehow parked the bus in the first leg at the Santiago Bernabéu, it seems only fair to say that the Red Devils ended up approaching this second leg with a similar strategy. The Merengues ended the game with a 63% ball possession, but Sir Alex Ferguson knew better than anyone else that giving out the ball to their opponents and defending tight at the back was still the best gameplan he could pick to send his team through in the Champions League. The first half-half wouldn't bring any goals into the game, but as time was passing by, so was Real Madrid's time window to score a goal that would put them in front for the first time in the series. However, it would be United breaking the deadlock in the 48th minute, in an attacking play preceded of an offside that should have been called against Robin Van Persie. The linesman was caught distracted and Nani would end recovering the ball after a bad clearance from Varane, just before sending in a low cross into a dangerous zone inside Real Madrid's penalty area. The pass was slightly deflected on Welbeck's foot, which tricked Sergio Ramos and forced him to touch the ball back into his own net. Diego López tried to react but there wasn't much he could have done to stop that unfortunate touch and Manchester United had just went one goal up in the game and in the aggregate score. A corner-kick given to Real Madrid on the 61th minute would lead to another controversial play, as Higuaín header got blocked by Rafael's arm, just a few inches from the goal line. This time, the referee's decision of not calling a penalty-kick against United and showing the respective red card to Rafael, went clearly to the home side's favour. The Turkish referee Cünet Çakir, would remain on the spotlight later in the game, as United fans claimed for two penalties, first for a handball call against Sergio Ramos and afterwards already near to the final whistle, on another Ramos challenge, this time against Evra. If at least one of those decisions had gone in United's favour, it wouldn't have shocked anyone who was watching this game from a neutral standing point. Far from shining as he's used to over the past years, Cristiano Ronaldo was struggling to find enough spaces to set a difference in the game. However, the former Manchester United star wouldn't waste his chance to leave a mark in this game, and would put Real Madrid on the lead for the first time in the series, in the 69th minute of the encounter. The moment that all United fans had nightmares with over the past months was about to happen, as their beloved idol scored the decisive goal at Old Trafford, a goal that would end up knocking out Manchester United from the Champions League dream. 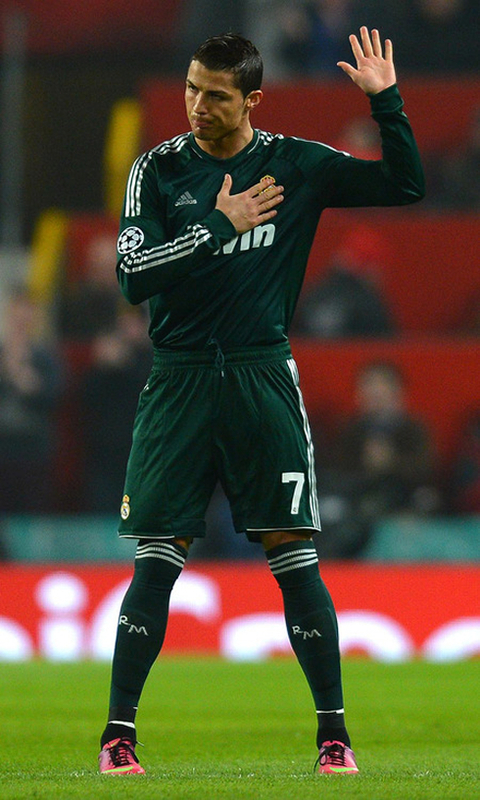 Cristiano Ronaldo's immediate reaction after scoring against Manchester United was an apology gesture, similar to the one he had already done at the Santiago Bernabéu, in that Real Madrid 1-1 Manchester United on February 13. With one man down and for the first time trailing in the series, Sir Alex Ferguson finally started taking tactical risks and Manchester United went seeking a goal that would put them back in the discussion. The match opened up for its final minutes, but neither Real Madrid or Manchester United would score anymore, meaning that the Merengues confirmed their presence into the UEFA Champions League next round. 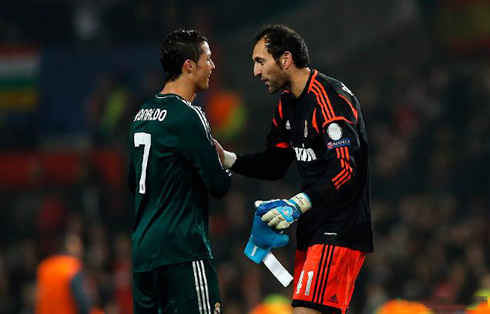 A final word of praise for Real Madrid's goalkeeper Diego López, who once again proved to be up for the responsibility of defending the goal of one the biggest clubs in the World. The competition's quarter-finals draw will take place next week, on March 15. Cristiano Ronaldo next game for Real Madrid will be against his former team Manchester United, on March 5, 2013, at Old Trafford and for the UEFA Champions League. You can watch Juventus live stream, Celta de Vigo vs Real Madrid, PSG vs Valencia, Steaua Bucharest vs Chelsea and Juventus vs Celtic, all matches provided from our soccer live section.